Contribute their vocational talents to the problems and needs of society. Strengthen the emphasis on vocation and classification in new member recruitment and induction. Identify means of emphasizing vocation in club activities. Create a stronger emphasis on business networking with integrity in Rotary at the club and district level. Focus more attention on business networking with integrity as a means of attracting and mentoring the new generation. Emphasize the connection between the Four Way Test and the Rotary Code of Conduct (formerly called: Declaration of Rotarians in Business and Professions) and their importance to the values of Rotary. When professionals join a Rotary club, they do so as a representative of their classification – their particular business or profession. Rotarians have the dual responsibility of representing their vocation within the club and exemplifying the ideals of Rotary within the workplace. 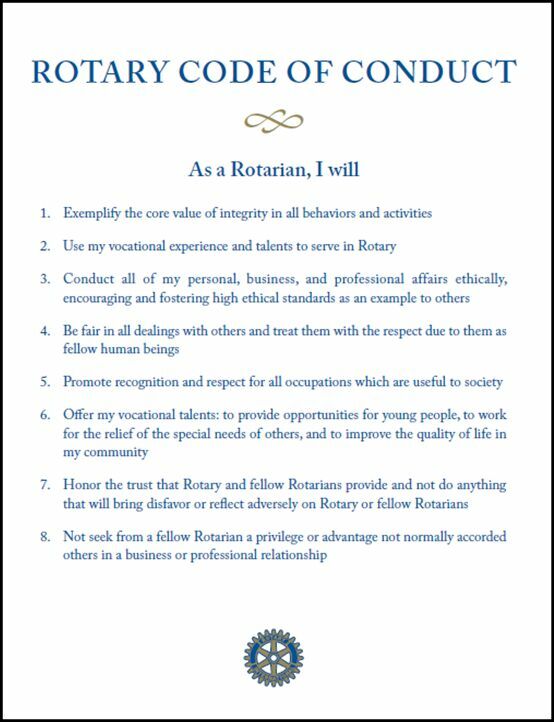 One of the central goals of Vocational Service is to promote and advance Rotary’s high ethical standards. Two useful tools Rotarians have to assess these standards are The Four-Way Test and The Rotary Code of Conduct.